The winter blues have set in this week. It is just too darn cold here! Those north of me, how do you stand it?? The good news is there will be a warmer day come Saturday, highs in the lower 50's. I can get excited about that as most days this week have started at 9 or 10 degrees and then gets up to 27 to 30. I have never been a fan of cold weather and don't have any plans to change that. I have not been back into the sewing room to do any thing remotely related to sewing. My second top is still ready to be cut out but just have not had the urge to do anything about it after work. Because it is Friday, I feel a glimmer of hope that I will be motivated to get in there and cut out the second top and get those machines ready to sew. Good thing is I can use the same color thread for both projects! Next week I am traveling again for business for a couple of days. Hopefully no long distance travel the remainder of the month. This morning I planned to sew the grey Renfrew top. Yet reading Pattern Review digest this morning and reading several reviews of McCall's 6796, I decided that I would cut out the pattern pieces, make pattern adjustments to cut out a lovely sweater knit fabric I just purchased from EOS earlier this month. The weather continues to be frigid in my neck of the woods; I wear a lot of pants or skirts with tights and boots when it is like this. I need new tops and I bought this pattern when it was first released so why not make it up now also. So pattern pieces are adjusted and I hope to cut out the fabric this evening. I was glad I decided to do this as I am now getting ahead on my sewing by having two projects ready to go. I decided that I wanted to wear my new Renfrew Top, version 2 today. I got my DH to take photos after we got home from having dinner and shopping. I used a photo editing feature to highlight the photos to showcase the bright colors of the fabric. I really like this version of the top. The fabric is a soft but slightly heavier knit than the knit I used for the first version I made about two years ago. This was the first version; I used a lightweight metallic knit from Mood. I love this knit, not scratchy as previous metallic knits I acquired in the past. It was also a little see through and I wear a camisole or tank top under neath normally. This new version is from a knit I acquired in 2013 from EOS. I am liking this pattern so much that I am getting ready to cut out a knit fabric I acquired from Waechters Fine Fabrics in Asheville, NC in 2011. It is interesting how each version has a different look depending on knit fabric chosen. This gray fabric is textured. Yes, I fell off the no pattern buying until March band wagon! It seemed a lot of Club BMV emails were coming my way and then the improved Vogue Pattern magazine proved to be too much. So I bought three Vogue patterns. And then reading Pattern Review there was a Simplicity knit top that matched up with a Pinterest top that I had pinned. So I bought that pattern plus one other one that was on sale at PR. 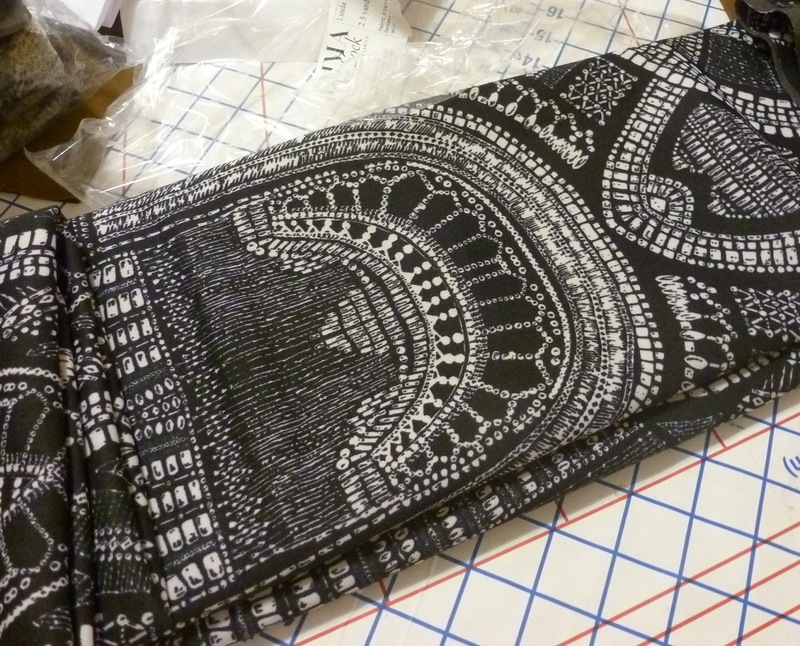 I also had a coupon for Michael Levine's Low Price Fabric and purchased two knit fabrics from him. I need to take shots of those so I can share. I also finished the Renfrew top and this will become my all time fabric cowl neck pattern. More later. Ending on a positive note! My last post was rather negative. 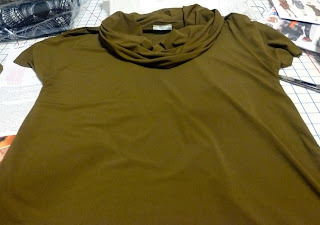 I decided I needed to end the day on a more positive note and wanted to show you the Renfrew Top #2 work in progress. For a cowl neck top with nice drape but not so low, this is the better top for me. The only thing left to do is sew the hem band and sleeve bands. That will have to wait for another day. This is a nice feeling knit; it was a little fiddly at times to sew but it stitches up well. Next up is a skirt using a Sandra Betzina Vogue pattern that I have had for several years. I purchased a nice Italian wool fabric from Mood late last year. With the continuing cold weather I think I will get some good wearing time from it. Last week I was out of town for a few days for business travel. The rest of the week was a work week for h***. The ending of the week was good as not only was my birthday coming up; it was a long weekend as I had today off as well! 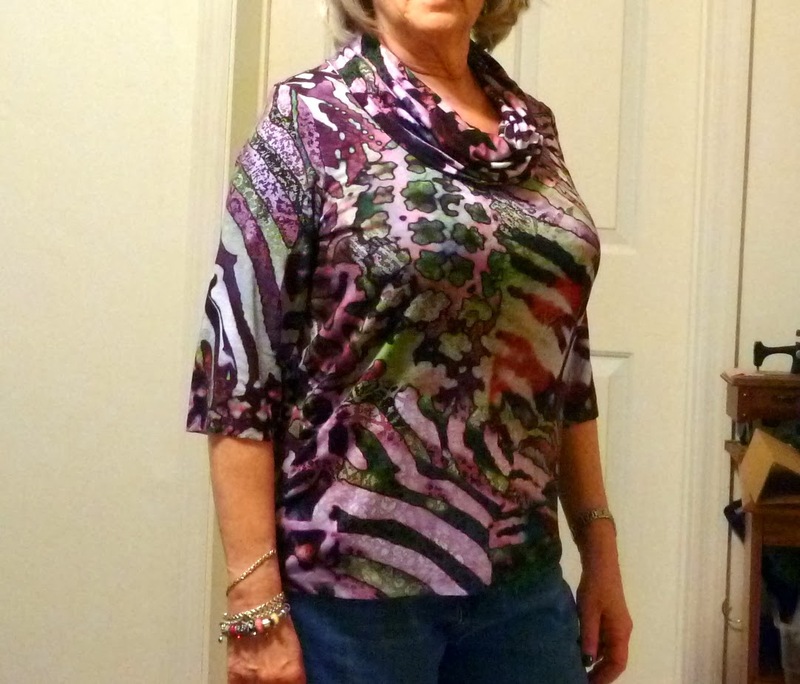 So having some extra time this weekend, I completed my garment of the month which was the Kwik Sew top #4028 using a knit fabric from Fabric Mart. I am not all that happy about the top. First it is too low at the neckline and I have to keep playing with the drape to get it to lay like I want. I even raised the neckline 1.5 inches and still too low. 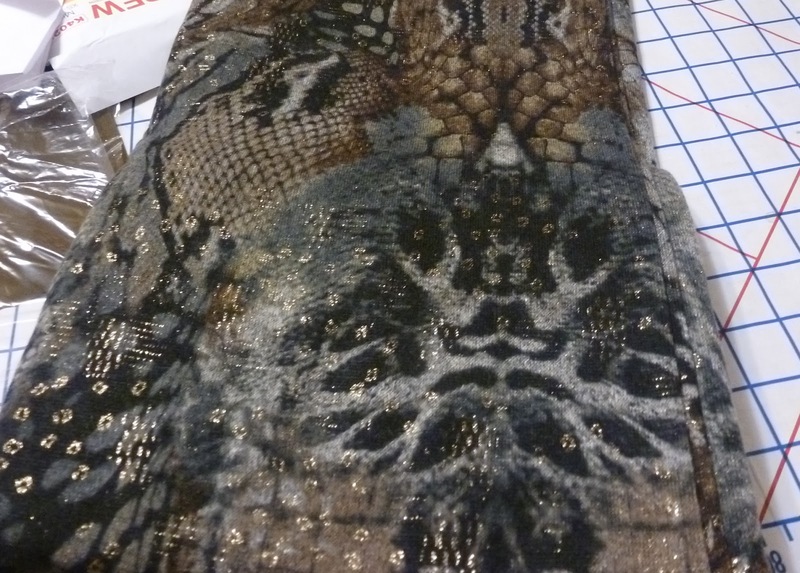 I have another drape neck pattern from KS that the neckline is too low as well. I cut a medium in upper chest and shoulders switching to large at bust to bottom. It was also way too long; I should have caught that during the fitting process. After cutting off an 1inch and 1/2, I ended up hemming it another 1.25 inches and it called for 5/8 hem allowance. Sleeves are cut on which were okay. I almost finished the top this afternoon. Work and life in general got in the way and now my energy is gone. Let me say at first I thought this top was going to be huge. I cut a medium through the neck, shoulder and upper chest area, grading to large from bust to hemline. 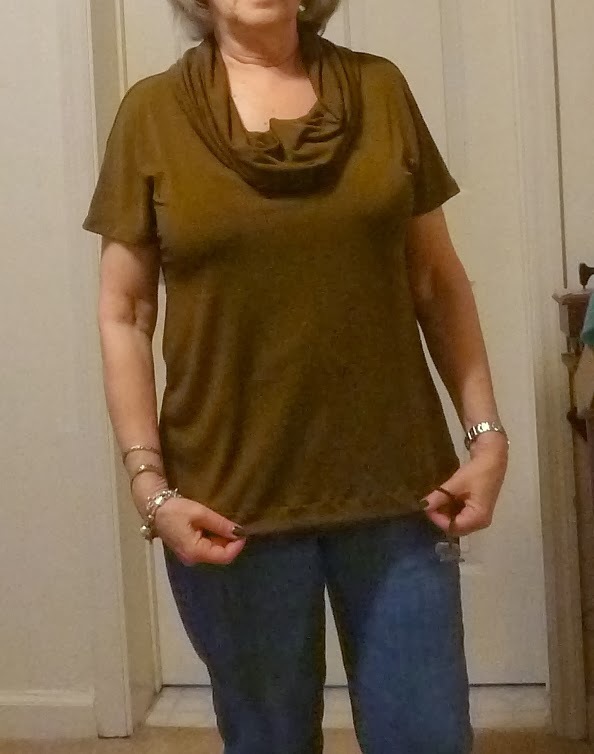 I raised the center front neck area on this top as I thought, rightfully so, that it would end up being too low for my liking and aging neck/chest area. When I held the front piece up before sewing, I thought wow this is still going to be low and huge. I stay stitched the front and back necklines to keep any extra stretch from occurring. I stitched the shoulders and then basted the side seams. After stitching the center back seam of the collar, I then basted this to the neck area. 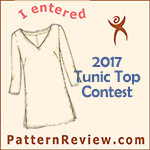 Once I tried it own, I was pleasantly pleased with the fit except for the length of the top, it looked like a tunic and came to right below my thighs, much longer than a top that was to end at the hip line. I put it off long enough but I needed to hem the camel/black skirt. I hand stitched the hem as I did not like the look of the blind hem using my sewing machine; the lining was stitched using sewing machine. I also ended up having to undo the waist facing/lining from the skirts at side and center back seam as I just felt the skirt was too loose still in the waist area. Taking an additional 3/8 seam at the waistline down about an inch, truly made the fit better. Skirt is now ready to wear. I also tweaked M6844 cardigan by taking a deeper seam just above and below the waistline. 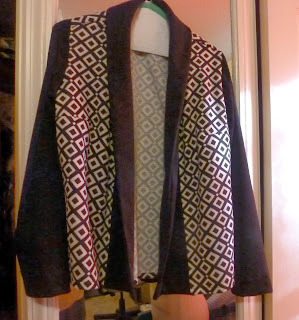 Earlier this morning I stitched down the front lapels from waist to bottom edge. The boucle knit is rather thick and the lapels did not turn back and stay as I wanted. It also added to much bulk at the center front at my tummy and I did not find that very flattering. I hope to take some photos of me wearing both soon. I just was not in the mood for photo taking tonight. 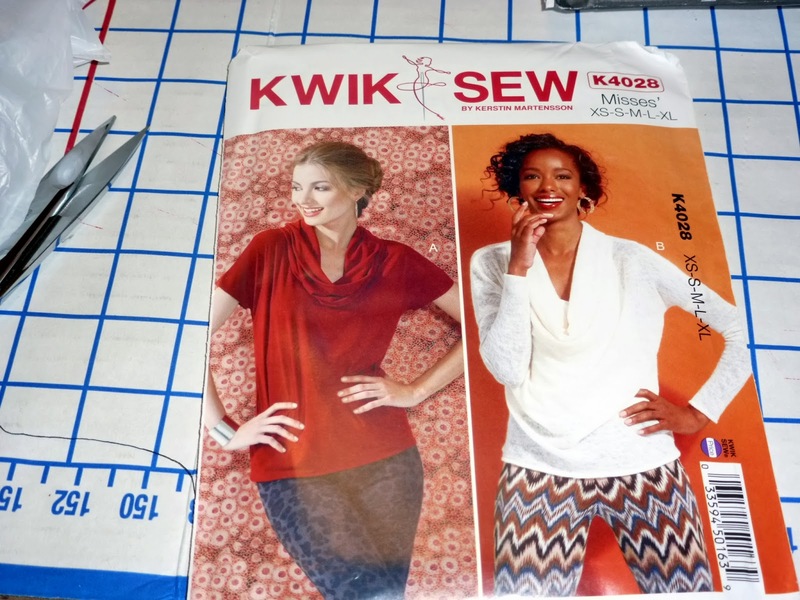 My January garment of the month will be what I hope is a super easy Kwik Sew top. I am going to make the red version. The sleeves are cut on. I am hoping that this will work out well for me. 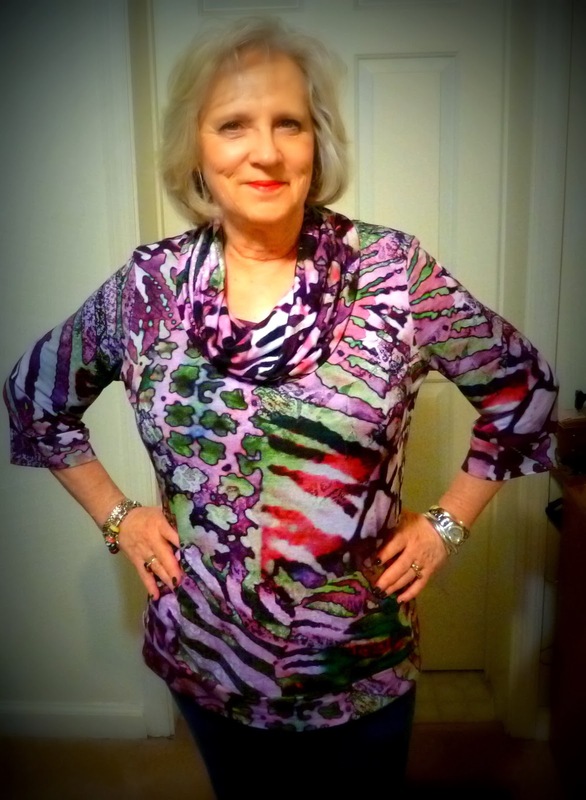 I decided to go simple for this garment of the month and plan to sew up several tops this month. I wear a lot of skirts and pants for work. Most of the tops I have been wearing have gotten a year or more of constant wear and time to replace. 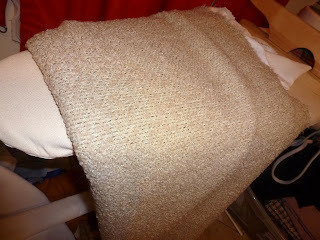 I am using a golden brown knit that I recently purchased from Fabric Mart last month. The other top I want to sew is this KS pattern. I actually like both tops but plan to make the one on the left but make sleeves longer. Got to run, have to get ready to go to work. Yesterday fabric arrived from EOS, pictures to follow soon. I finally completed what was to be December Garment of the Month. After making View A of M6844 in stash fabric and perfecting the fit, I cut out View C and cut out the boucle knit fabric from Fabric Mart. I enjoyed sewing this project and can understand why so many other sewists have chosen to make this cardigan time and time again. Many reviews indicate that the pattern runs large and that the fronts do meet. I found that to be somewhat true. When I sew a pattern that is sized by xs to xl, I always fall between what I size I really need. As with this pattern, I purchased the xs-m because the bust measurement is the right size for the upper chest. I need the large for my bust size but medium works great for my back. The large was not included in this pattern so using the medium required a FBA. I made a a one inch FBA and kept the resulting dart. I actually had almost completed this cardigan-M6844-but still had some sewing to do the next day (1-1-14) so I guess this will be my first project for 2014 as well as the last project I was working on for 2013. This is View A and pretty much all fitting adjustments were made to this one and pattern pieces have been adjusted now also for the next version. I am not sure if I will wear this all that much but I did use up some of my stash. I have cut out the knit boucle fabric and it is ready to sew. I am making View C with short peplum. 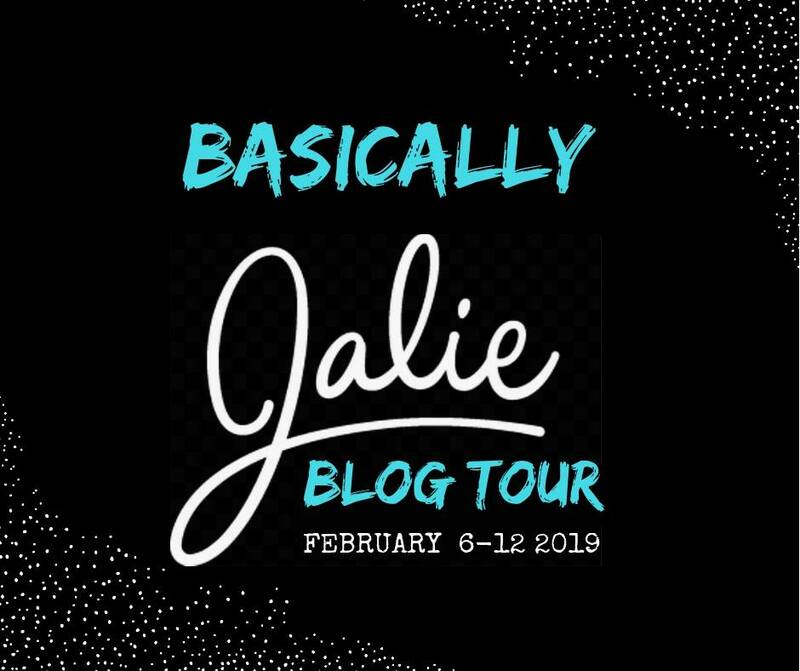 I just got home from visiting family in Danville so no sewing this AM; I will be in the sewing room soon after posting this. I need to get machines set up and start sewing. This is an easy sew and now that I have done it once the second one should go smooth even though it is a different view. I will share my fitting adjustments and hopefully take a photo of me wearing this later today/tonight. This is my third version of this skirt. Love the style and the fit. This was my second version of this dress. I really like the style and look. 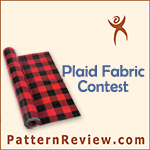 My first version was short sleeves and from a vintage sheet that I won as a giveaway on another blog. 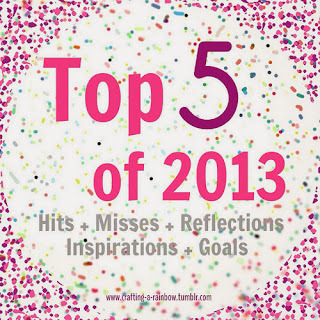 And number 5 hit is Vogue 8742. I made two of this dress and both were hits with me, my DH and my co-workers.